Art in words — Barron is the only writer who uses this style. His poems are written with pictures of emotions. This book is full of memories and emotions, and memories of those we love and have loved. There’s so much more to say; yet we’ve touched some feelings, so that we can again feel what we felt then. We trust the reader will love and enjoy these simple past experiences and ideas we hear everyday. Experiences with feelings, could that explain the poetry, and helpfully something that everyone can be given as a gift to someone who has experienced a loss. We all have and will several times during our life that seems so brief. This illustrated collection is both a book and greeting cars to express your love. 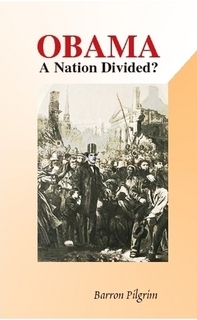 OBAMA - A Nation Divided? The Obama Spiral -- problems related to the new President, why Barack Obama should not have been elected, difficulties ahead for America. A frank commentary on the danger of extremism and division among the people. Our lives are filled with miracles. Some we pass off as just coincidence, yet we know we are on a journey, and that journey has many surprises. In this book you will find simple, relaxing poetry, and perhaps blessings to share with others. Enjoying these poems may bring to memory some miracles of your own journey. A special Christmas greeting and gift book-- Christmas poems that bring back memories of holidays, family, the joys of celebrating the birth of Jesus, and the true meaning of Christmas, to enjoy all year round. Relaxing, nostalgic poems with lovely full-color illustrations. Enjoy the romance of ideas; ideas and options sometimes humorous. Romance and love are always the best topic and they surface in most all situations. Relax and enjoy the simple wisdom of love and just maybe you will see some parts of yourself in the lines, and that you are on the earth as someone's interceptor, and helper for those purposes. You will be blessed as you find your purposes. They are many.